Outside the Royal Albert Hall blue-bereted devotees were handing out free EU flags. A great many people accepted them, while some with the Union Jack looked on askance and muttered. But inside, all differences were firmly put aside: every flag under the sun was there for the Last Night of the Proms party, along with the glitter poppers, an inflatable parrot and a model kangaroo. 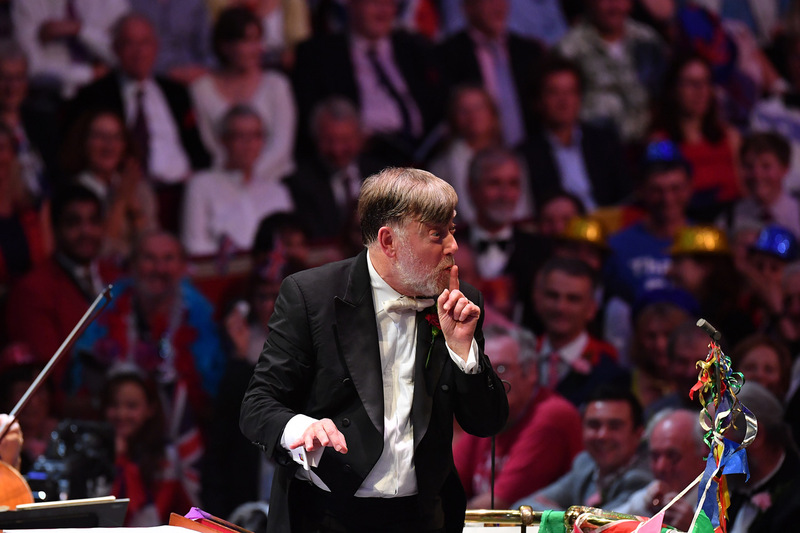 On the podium, a familiar figure: Sir Andrew Davis (pictured below), long-ago emeritus conductor of the BBC Symphony Orchestra, owning the night again after some 18 years away, but as much at ease as if he’d tackled the job only yesterday (not for nothing did his podium declare "HOME"). And his cavalcade of music celebrated the old, the new and, if not quite the borrowed, then certainly the blue – Stanford’s The Blue Bird, enjoying rare, richly deserved prominence. But first: the somewhat unlikely figure of Paul Hindemith. His Overture to Neues vom Tage (1928-30), an early satirical opera, certainly looked topical, and with its glittery orchestration and off-the-wall rhythms it made a suitable opener. Berlioz’s "Fantasy on Shakespeare’s The Tempest" from his companion-piece to the Symphonie Fantastique, Lélio, ou la retour à la vie, is almost as unusual. It boasts glistening harps and airy-toned sopranos calling to Miranda, grunting double-basses banishing Caliban. The composer’s passion for Shakespeare beamed out of every bar. The big new commission for this Last Night came from Roxanna Panufnik: Songs of Darkness, Dreams of Light, commemorating the end of World War I, but going emotionally well beyond that. (Disclaimer: I wrote her a libretto recently, so won’t go on at length.) Two complementary extracts of poetry mingle in its ten-minute span: lines from Khalil Gibran’s The Prophet meet the British Jewish poet Isaac Rosenberg’s In the Underworld (1914). The BBC Singers and BBC Symphony Chorus made the most of the hall’s antiphonal potential. “Farewell to you and the youth I spent with you,” writes Gibran – and the music, with exotic chants woven into its fabric, (Ashkenazi for Rosenberg, Maronite Syriac plus Sufi-style percussion for Gibran), pulls us into an inward vortex of dark-hued meditation. Charles Stanford, though famed as the teacher of many fine British composers of the early 20th century (Vaughan Williams, Holst, Coleridge-Taylor, Bridge, et al), often exists only on the sidelines of concert repertoire. But his Songs of the Sea, on poems by Henry Newbolt, were a terrific vehicle for the evening’s star singer, the Canadian bass-baritone Gerald Finley (pictured below). He brought them oodles of character, backed amply by the men of the chorus; and some of the music surges and swells like the ocean itself, with harmonic beauties in ‘Homeward Bound’ that wouldn’t have disgraced Richard Strauss. Finley’s resonant beauty of tone and splendidly precise way with expression made him a great Hans Sachs in the contained acoustic of Glyndebourne, but he is perhaps not best served by the cavernous Royal Albert Hall, submerged too often by the full orchestra; I’m looking forward to revisiting the performance on the broadcast, where he may have come over more strongly. But oh, Stanford’s The Blue Bird – what a hushed, mystical piece of choral a cappella twilit gorgeousness. The BBC Singers rarely rose above pianissimo. It’s not the most obvious Last Night piece, but how wonderful that some will have heard it here for the first time (even if what’s meant to be a soprano solo doesn’t quite work with more than one singer to the part). Finally, beside the shadowy, malleable colours of Panufnik and Stanford, Parry’s Blest Pair of Sirens arrived like a big cuddly teddy bear, closing the first half with an all-embracing generosity of spirit: an all-out celebration of music itself. And so to party time: a fine send-off to the season, without descending into a send-up. First, a quick excursion to France. Davis really “gets” Saint-Saëns, giving the (horrifically named) “Marche militaire française” from the Suite Algérienne an up-tempo, boulevardier, twinkle-toed charm. This was, though, mere curtain-raiser to a glorious turn by one of Britain’s most thrilling young musicians: Jess Gillam, the saxophonist from the Lake District, lighting up the hall with her seemingly effortless virtuosity and limitless expressiveness. Milhaud’s jazzy Scaramouche (1937-9) couldn’t have been a better choice. Gillam is all set for stardom: to listen is to love her. In the Soliloquy from Carousel, Finley turned himself beautifully into Billy Bigelow, dreaming of his future children, before he and Gillam joined forces with the choirs - and audience - to give four popular songs from World War I plenty of welly. A slightly odd flavour lingered as we recalled, in celebratory mode under the flags, that slaughter of thousands. Have we really forgotten that the EU is the reason we have not had a war in Europe in seven decades? You’d think that would be worth celebrating. Finley’s Rule, Britannia! had no lavish costume à la Flórez or knicker-throwing à la Kaufmann: he simply unfurled a flag British on one side and Canadian on the other. Neat and to the point. 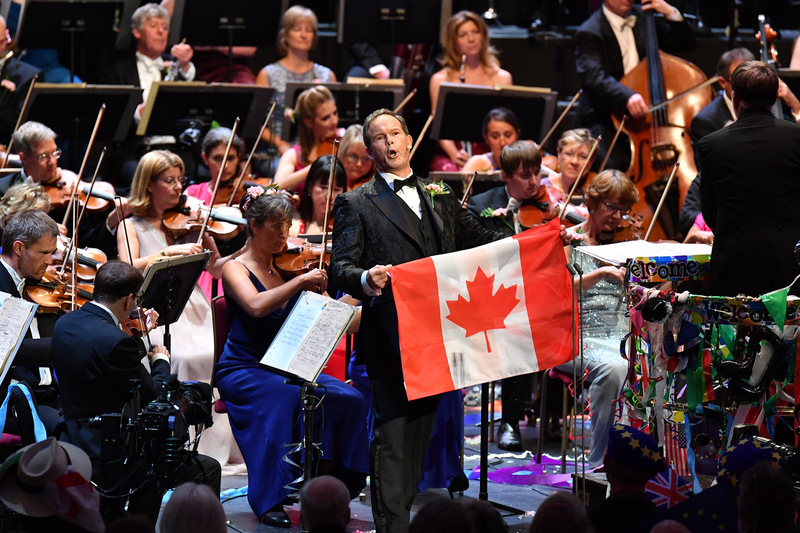 So, too, was Davis’s speech: it celebrated all the musicians who’ve performed in this highly enjoyable Proms season and the ability of music to bring us all together and provide “spiritual” strength in troubled times. Some of us wished he would use this worldwide platform to draw attention to the decimated future Britain’s musical life faces if hard Brexit murders musicians’ freedom of movement. It’s an absolutely international industry and it costs money. In the worst-case scenario, the Proms could be reduced to a mere skeleton – if they continue to exist at all. I can’t be the only person who reflected, while bawling out Blake’s blessed words of Jerusalem, that we’d better enjoy this while it lasts.